Let’s say you come up with a great idea for a company. You create a logo, a business plan, and reach out to your network of friends and professional contacts. You are thrilled and feel like you’re on an upward trajectory… But you still struggle with getting your name out there. 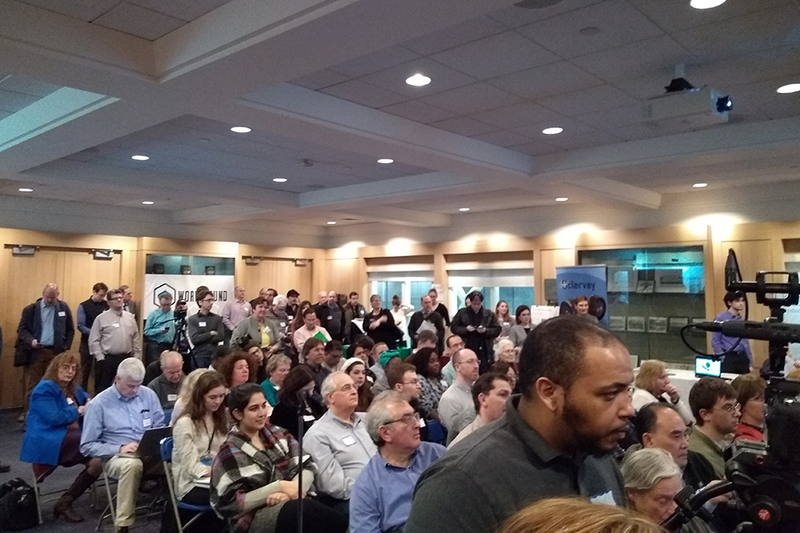 Overcoming that challenge is the goal of Mass Innovation Nights: to help budding entrepreneurs get greater visibility and connect with members of the local innovation community. On March 14th, Brandeis University hosted Mass Innovation Nights 108 on what was also the ninth anniversary of its inception. The event hosted eleven teams, ranging from gently vibrating mats to calm crying babies to a sensor that can detect anomalies and leaks in water pipes. Some teams were at Brandeis’ own Innovation Showcase back in November, and were excited to get another opportunity to speak to new people and present their progress. Every month, Mass Innovation Nights brings together about ten companies at various venues throughout metro Boston. Organizations volunteer their space and, often, also sponsor a team. Previous locations include Google, Verizon, and TripAdvisor. The main idea behind this is that people can come together for one common goal: to collaborate and share enthusiasm for Massachusetts startups. Researchers, social media experts, volunteers, and curious attendees are able spread the word about emerging products via social media, creating high visibility for participating startups. Over the course of nearly a decade, this pioneering method has launched over a thousand new products, connected thousands of job seekers with hiring managers, and profiled hundreds of local experts. Around 5pm, the teams could be seen setting up their tables and putting the finishing touches on their presentations, while a few finished setting up even earlier. One such team was that of Melissa Gersin '05 from Tranquilo Mat. Prior to starting her own company, Gersin worked as a maternity nurse who saw first-hand how difficult it can be for parents to calm a child, especially if he or she is anxious or has colic, like she had as an infant. Bonding with one’s infant is incredibly important, and this is what inspired her to start her company in 2013. Having been on Shark Tank, and now with her products for sale in Target, Mass Innovation Nights is another invaluable stepping stone to further her company and help infants (and parents) sleep more peacefully. The doors opened at 6pm, thus signalling the official start of the event. The energy in the Gosman Athletic Center was remarkable. Each of the tables were packed with interested attendees. People had to actually wait in line to be able to speak with entrepreneurs! One particularly popular table was that of ThermaGenix. We spoke with John Rice, one of the co-founders, who illustrated the amount of research time and cohesive teamwork that has gone into their current product. Having worked at Brandeis University for 21 years, he reiterated that one of the most important parts of starting a company is getting along with one’s team, and he is grateful to be a part of one that still works well together after all those years--his co-founders include Larry Wangh, professor of Biology here at Brandeis. In 2016, ThermaGenix and the Brandeis Office of Technology Licensing organized an exclusive licensing deal for the company’s products, and ThermaStop, ThermaGo, and ThermaStop-RT were the result. These breakthrough technologies make gene sequencing more accurate, with important implications in the health sciences. To date, the team already has a number of global partners. Like the rest of the team, John is excited to be able to contribute to groundbreaking research that can better the lives of others. By 7pm, as the supply of pie (meant to celebrate Pi Day) was running out, the presentations began. In an eager silence, guests first heard from the hard-working women helming the event: Bobbie Carlton, founder of Mass Innovation Nights and Rebecca Menapace, Associate Provost for Innovation at Brandeis University. After they spoke, team members from four startups, selected in advance by audience voting, presented their pitches. Some pitches questioned the way things are done now and why they should change, while others reinforced an excitement for the future of technology. Each pitch was met with intelligent, thought-provoking questions, to which presenters responded with impressive and clearly well-thought-out answers. Finally, the winners of the evening's audience vote were announced: Articulate Biosciences, the brainchild of Benjy Cooper, Ph.D (BS, '11). He and his team, participants in our I-Corps program, have developed a groundbreaking treatment for osteoarthritis, which could potentially improve quality of life for millions of patients worldwide. The passion, dedication, and hard work of each team showed the level of professionalism and social responsibility that are becoming hallmarks of Brandeis Innovation startups. While each start-up at this event was unique and potentially life-changing, it’s impressive to think that this happens every month. The Boston community is unparalleled in that there are an incredible number of researchers and scientists who are ambitious and passionate about their craft. With its first foray into hosting Mass Innovation Nights, Brandeis University truly took its place in the Boston technology startup ecosystem. Be sure to stay up to date on future Mass Innovation events via the newsletter here, and all things Brandeis Innovation here.